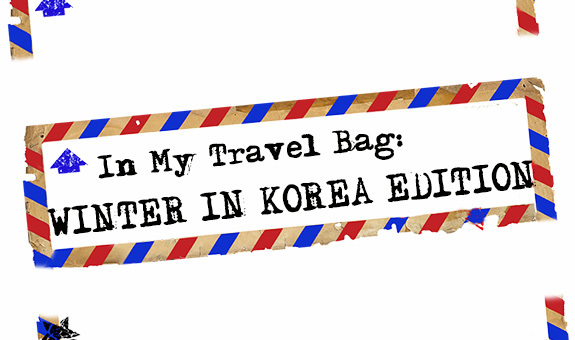 If you haven't already seen my posts on Instagram and Facebook, I am heading to Korea in a couple of days! I am, of course, packing makeup to take with me, and this post will share some of the products I am bringing along with me! When it comes to travel, I like packing products that I know will work for me, as well as pop a couple of new products in there just because I get a little bit excited whenever I purchase something new. I like products that will last the whole day without touch-ups, and that are easy and quick to apply. Something I like is being able to take along with me an eyeshadow palette with all the eyeshadow colours that I want, and not a bit more. 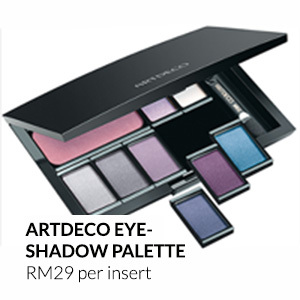 ArtDeco, a German cosmetics brand that recently launched in SaSa here in Malaysia, is perfect for that. Their eyeshadows are mid-range and very pigmented and easy to blend, and come in a huge range of colours that you can pick and choose from to insert into your customizable palette. At only RM29 per insert, but with quality comparable to MAC and Inglot eyeshadows, this is an absolute steal! ArtDeco also does a range of beautiful foundations, each one suited to a different skin type and preference, so if you want good quality at a decent price, this brand is definitely one to look out for the next time you visit SaSa. They also release limited edition empty palettes from time to time, so look out for them when the different seasons come around. This isn't a makeup item per se, but I am a huge believer that skincare sets the base for beautiful base makeup. 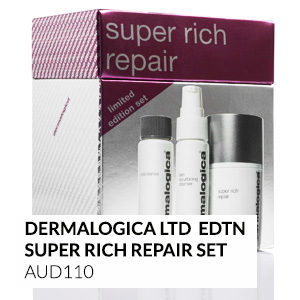 This Dermalogica Super Rich Repair set is limited edition, and comes with their AGE Smart Super Rich moisturiser, Skin Resurfacing Cleanser, as well as a bottle of Dermalogica's famous Precleanse. I know this is going to be perfect for the freezing cold, dry Korean winter, so I am definitely packing this! This moisturiser is very, very rich, and is perfect for drier skins. I've been using it in tiny amounts even here in Malaysia, and haven't experienced any problems with it so far. Remember that even oily skin needs to be hydrated (in fact, skin gets oily from of lack of hydration), so you may not even know that you need this type of moisturiser! Your best bet? Head to a Dermalogica counter for a free face-mapping skin analysis. Your skin will thank you for this. This heartbreakingly cute collection is a Shu Uemura design collaboration with famous Anime artist Takashi Murakame. The reason I'm bringing these along? The palette features a brand new eyeshadow formulation called the silk smooth eyeshadow, and my goodness they are ravishing! The textures are spongy and so silky smooth, and pigment transfers so easily with hardly any fall down! I am completely in love! The Lip & Cheek Fun-tasy's? They're so convenient because they are multi-tasking, and so easy to apply. Just dot on, and blend. Illamasqua always releases the most vibrant, unique seasonal collections, and their latest Christmas collection is no different! More to come on this collection soon, but my favourite by far (and a very safe bet, I will admit) is their Intense Lip Gloss in Maiden. This is a beautiful peachy-pink lipgloss with great coverage and lasting ability, without compromising moisturising qualities. Since Korea is freezing right now, this is perfect for adding that little bit of slickness to the lips, and providing a protective barrier so I don't lose any moisture. 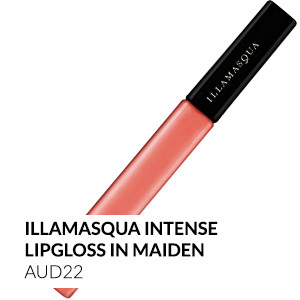 For more about the collection, check Illamasqua counters now. They have also released a beautiful clear polish loaded with white flakes, that looks like snowfall on your fingertips. So pretty! Before I say anything, let me comment on the brush case. Have you ever seen anything more beautiful?! The amazing holiday collection by Laura Mercier is styled in this exact way - with beautiful faux-croc skin, hard cases - in the classic Laura Mercier brown. This brush set is a great all-round brush set for the more experienced makeup user. It features a blush/powder brush, a couple of dual-ended brushes complete with blender and smudger brushes, a concealer brush, and a dual-ended liner brush. As if its gorgeous design wasn't enough, the hard brush case is also perfect because it protects your brushes from getting squished in transit. I know it costs about RM200+ here in Malaysia, but I can't be sure of the exact price. Once I check, I will update the post! These are my fail-safe eyeliners. 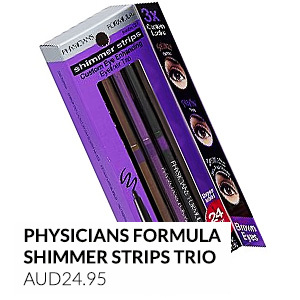 I don't like that they are sold in a pack where I am most likely to never use at least one of the three eyeliners, but there is no denying that this is the best eyeliner I have ever used, even compared to high-end, luxe eyeliners. This eyeliner is creamy and smooth (just remember to keep the cap on! ), pigmented (I like the black and it is a perfect, beautiful black black), and so easy to smudge. But its one star quality, what separates it from the rest, is that it does. not. budge. This is by far the most smudge-proof eyeliner I have ever used, and that's why it unfailingly goes into all my makeup bags and pouches, no matter where it is that I am travelling.